In the summer of 1891, William Merritt Chase (whose centenary we celebrate this autumn) ran the first of his summer schools in the Shinnecock Hills on Long Island. Five years later, he opened the Chase School of Art, which in two years became the New York School of Art. He continued to teach his summer schools until 1902, and at the New York School of Art until 1907. In 1909, it changed its name again, to the New York School of Fine and Applied Art, and again in 1936 to the Parsons School of Design, or just The Parsons. 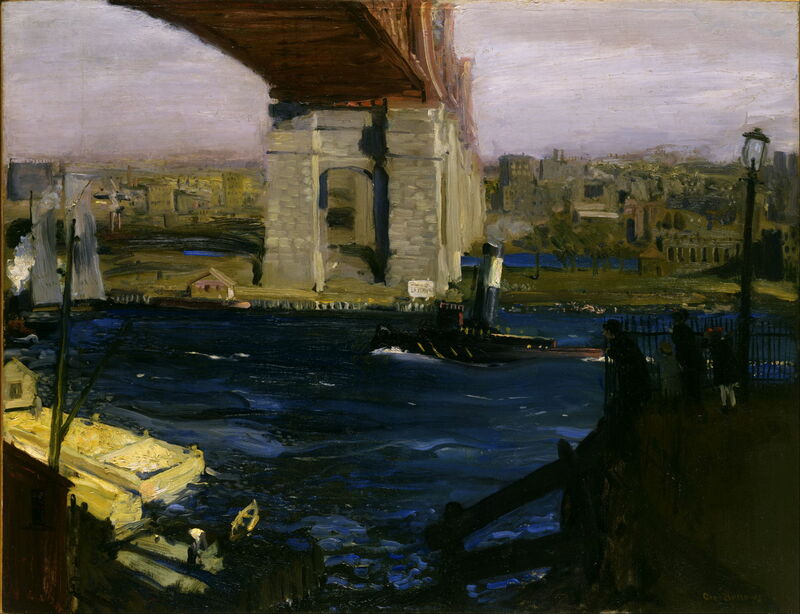 George Wesley Bellows (1882–1925) is one of the New York School of Art’s most famous and most accomplished alumni. Born and brought up in Columbus, Ohio, his first choice of career was as a sportsman. He studied at the Ohio State University between 1901-04, where he played for its baseball and basketball teams, and worked as a commercial illustrator. George Bellows (1882–1925), Gardiner’s Bay from Sag Harbor (1899), watercolor on paper, 25.4 × 38.1 cm, Museum of Fine Arts, Houston, TX. Wikimedia Commons. 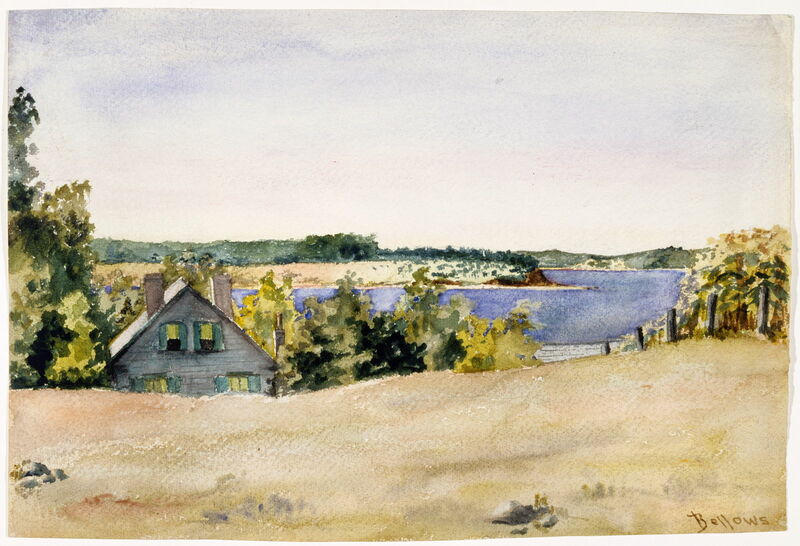 Gardiner’s Bay from Sag Harbor (1899) is a very early watercolor from his High School days, and shows this undeveloped little bay at the far eastern end of Long Island. Bellows then decided to become a painter, left university just before he was due to graduate in 1904, and moved to New York, where he studied at the New York School of Art, mainly under Robert Henri. George Bellows (1882–1925), Bethesda Fountain (Fountain in Central Park) (1905), oil on canvas, 51.4 × 61.8 cm, Hirshhorn Museum and Sculpture Garden, Washington, DC. Wikimedia Commons. 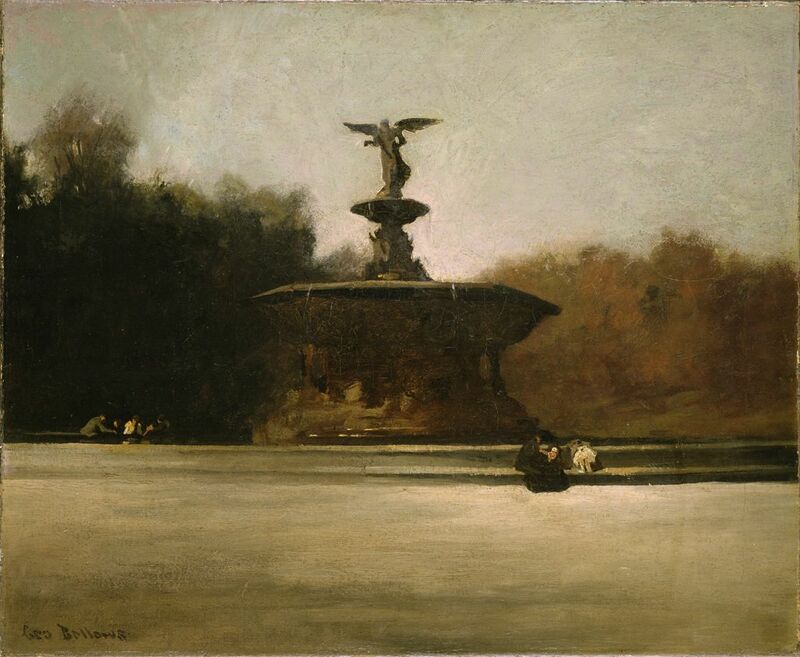 He painted Bethesda Fountain (Fountain in Central Park) in 1905, when still a student in New York. It shows, in rather sombre earth colours, this central feature of Bethesda Terrace in New York’s Central Park, a very local motif. This bronze statue was designed by Emma Stebbins, and in those days was still relatively new, having been unveiled in 1873. Its proper named is “The Angel of the Waters Fountain”, with the reference being made not to Bethesda, Maryland, but to the biblical location. By 1906, he had set up a studio in Broadway Street with another student, and was busy recording life in New York City. George Bellows (1882–1925), Forty-two Kids (1907), oil on canvas, 106.7 × 153 cm, The National Gallery of Art, Washington, DC. Wikimedia Commons. Forty-two Kids (1907) was one of the earliest recognisable works of what became known as the Ashcan School, which depicted the reality of city life in works “full of vitality and the actual life of the time”, in the words of Robert Henri. Here an incoherent gathering of street urchins and other kids has taken over a tumbledown wharf in East River for swimming, sunbathing, smoking, and generally hanging about. Although now used generally of children, at the time the word kids had a more specific meaning, referring to the unruly children of working class immigrants living in the tenements of Lower East Side. Bellows exhibited the painting the following year, and it was his first to be sold into a private collection. 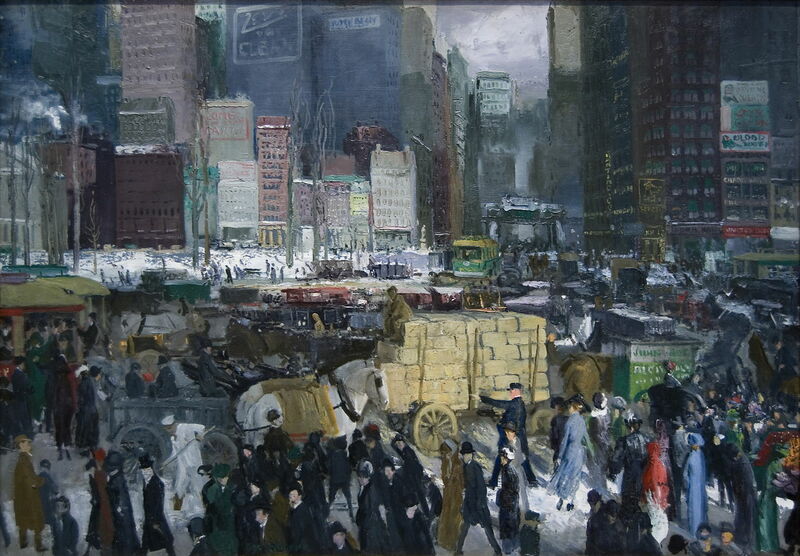 George Bellows (1882–1925), Pennsylvania Station Excavation (c 1907-1908), oil on canvas, 79.4 × 97.2 cm, Brooklyn Museum, New York, NY. Wikimedia Commons. Bellows’ views of New York are in stark contrast to those of Colin Campbell Cooper, although they were painting the city at the same time. Bellows’ Pennsylvania Station Excavation (c 1907-1908) shows the deep excavations made for the new station during the winter, caught in the last light of the day. 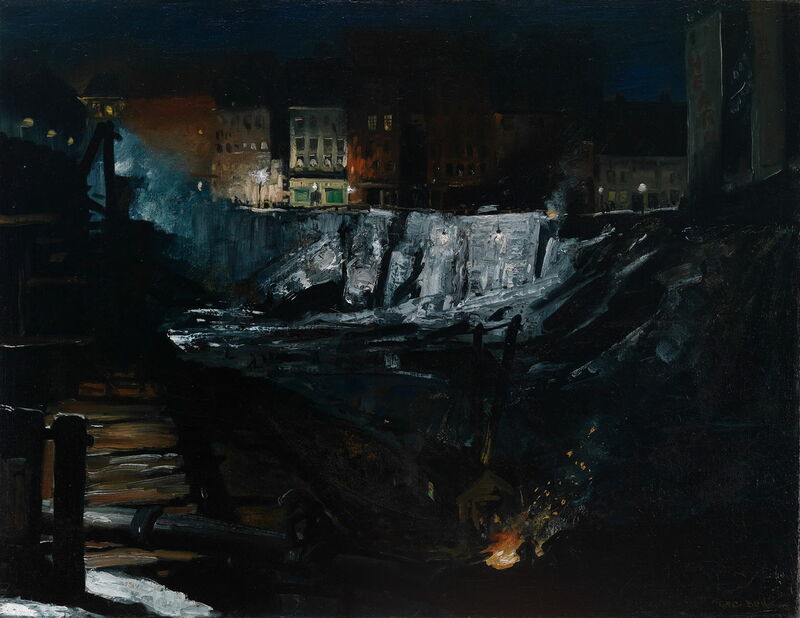 George Bellows (1882–1925), Excavation at Night (1908), oil on canvas, 86.4 × 111.8 cm, Crystal Bridges Museum of American Art, Bentonville, AR. Wikimedia Commons. 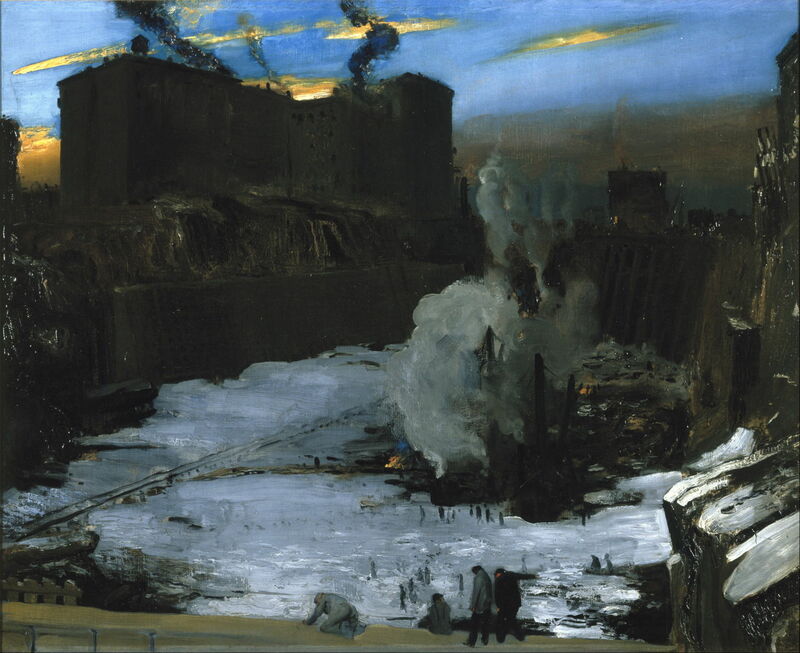 Excavation at Night (1908) is a nocturne, perhaps of the same site, again in the winter, with a patch of snow still on the ground. In 1908, he joined fellow students in organizing an exhibition which focussed on urban art. Some critics voiced concerns at the apparently crude style of his paintings, but others felt them to be suitably daring. He also started to spend his summers in Maine, following the example set by William Merritt Chase and Robert Henri. George Bellows (1882–1925), Haystacks and Barn (1909), oil on canvas, 56.5 × 71.4 cm, Museum of Fine Arts, Houston, TX. Wikimedia Commons. 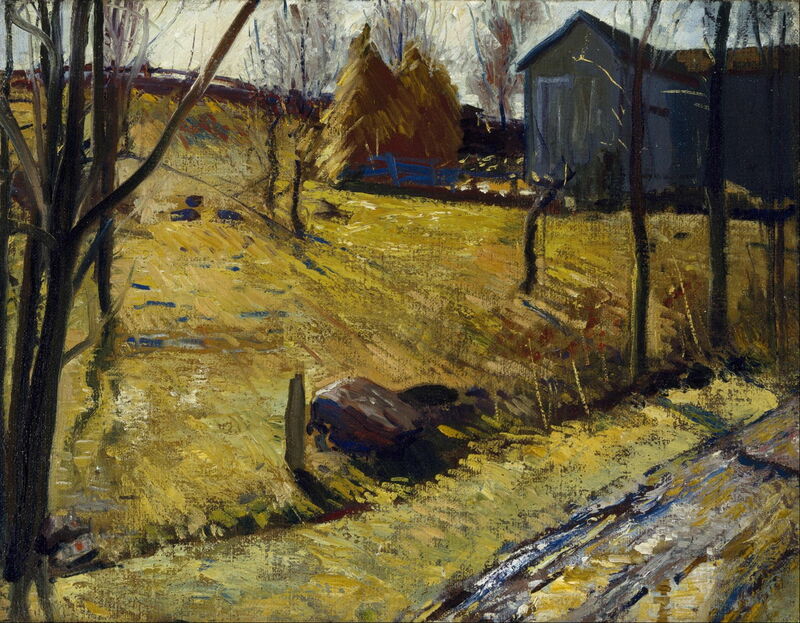 Bellows’ Haystacks and Barn (1909) was probably painted out in the Maine countryside during the summer of 1909. George Bellows (1882–1925), The Bridge, Blackwell’s Island (1909), oil on canvas, 86.5 × 112 cm, Toledo Museum of Art, Toledo, OH. Wikimedia Commons. Returning to the East River in New York, his The Bridge, Blackwell’s Island (1909) shows the Queensboro Bridge, which links Manhattan with Queens. Its piers rest on Blackwell’s Island (now known as Roosevelt Island). This view was painted from the Manhattan end in December 1909, shortly after it had been opened. At the time it was the greatest cantilever bridge in the world. From 1911, he associated with radical artists in the ‘lyrical Left’, and concentrated again on depicting the lot of working people. New York (1911) balances the world of the people of New York, with that of their buildings. It was shown that year in the annual exhibition of the National Academy of Design, in New York, and annually thereafter for the rest of Bellows’ career, but was not sold until after his death. 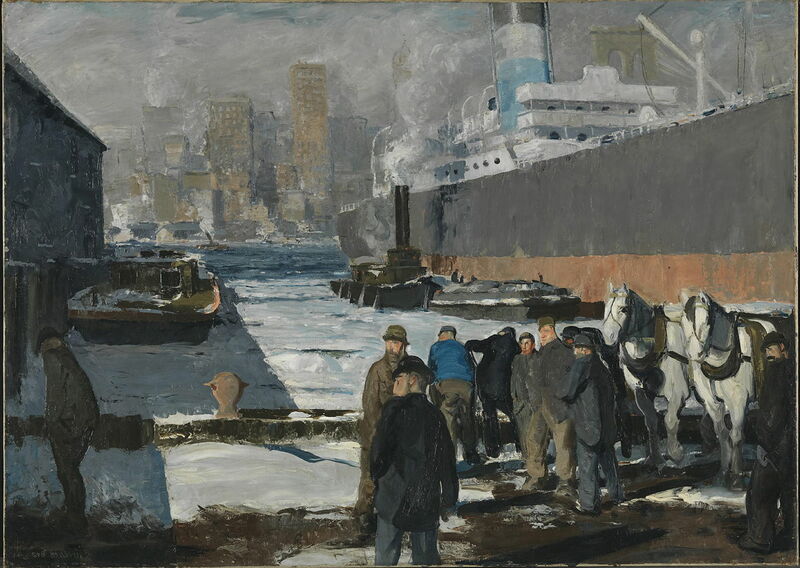 George Bellows (1882–1925), Men of the Docks (1912), oil on canvas, 114.3 × 161.3 cm, The National Gallery, London. Wikimedia Commons. 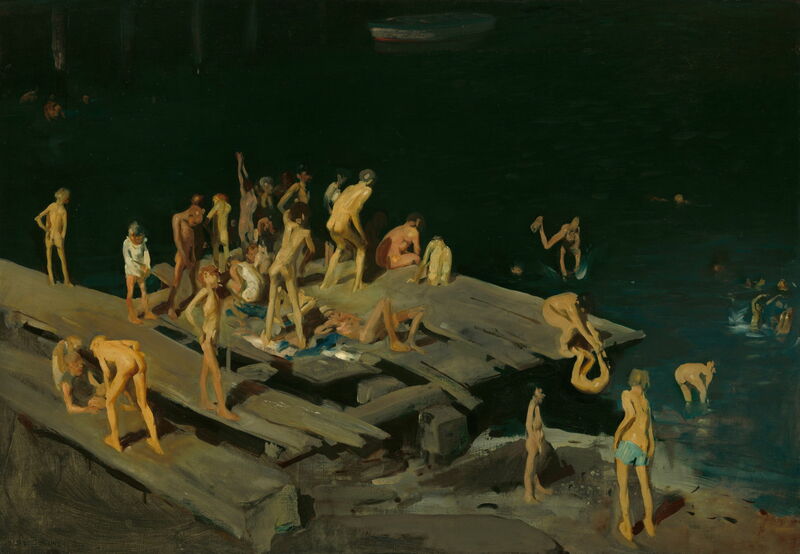 Men of the Docks (1912) has the unique distiction of being the first major work of a US artist to be purchased by The National Gallery in London, which paid over $25 million for it in 2014. It shows labourers who have arrived seeking work in the docks, in the depths of winter. The figures are seen against a backdrop of a cargo ship and the grey skyscrapers behind. 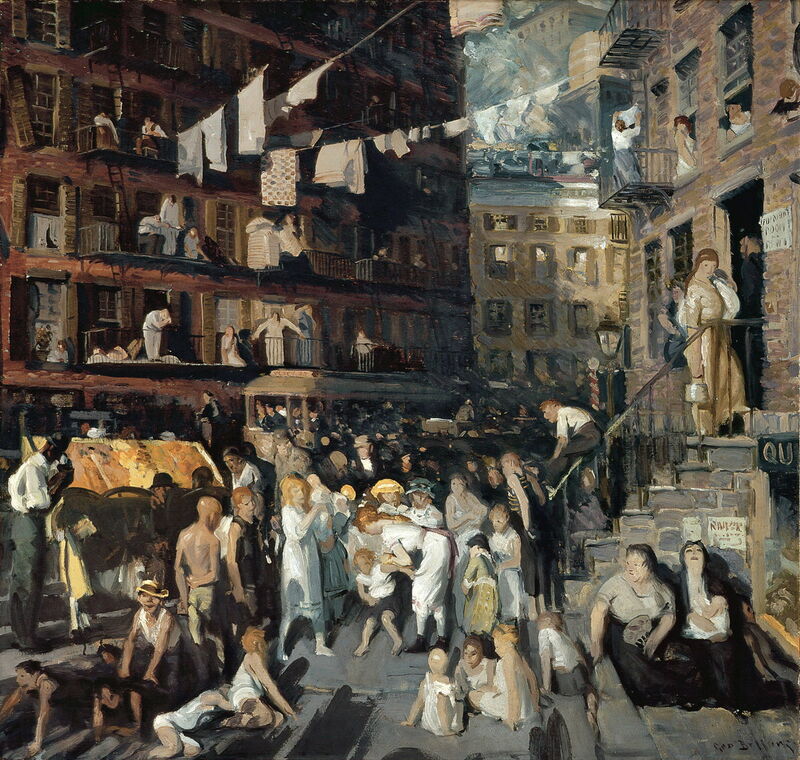 Cliff Dwellers (1913) shows the largely immigrant population of tenements in Lower East Side, whose children featured in Forty-two Kids. This was the first painting to be purchased by the county of Los Angeles for its new museum of art, in 1916, where it remains today. George Bellows (1882–1925), Rock Reef, Maine (1913), oil on panel, 38.1 × 49.5 cm, Museum of Fine Arts, Houston, TX. Wikimedia Commons. 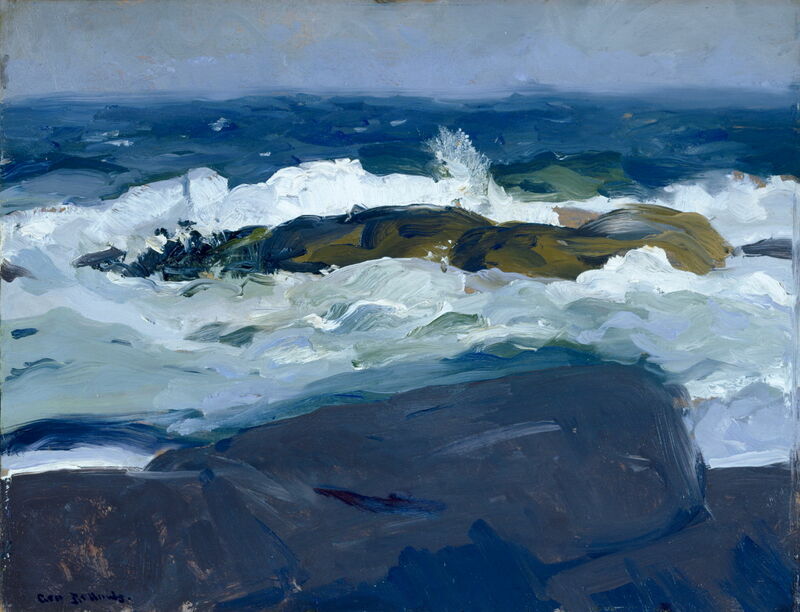 Rock Reef, Maine (1913) was painted when Bellows was out on the Maine coast. The second and concluding article continues the story of his life and paintings after the outbreak of the First World War, in 1914. Posted in General, Painting and tagged Ashcan, Bellows, Chase, Cooper, Henri, painting. Bookmark the permalink.